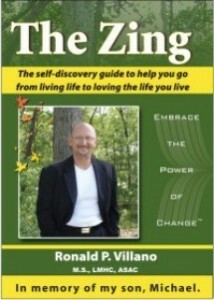 Draw inspiration from Ron’s own personal story of how losing his 17-year old son, Michael, helped him to create the ideas and principles behind The Zing. Ron’s proven methods will help you turn every experience into a win. It’s a book about real life situations that affect people and their decisions. Readers will be able to easily recognize their lives within these pages. All you have to do is apply these principles to your own life and see what happens. The transformation will be amazing. So, are you ready for change? Find out what Ron Villano learned in his walk from the depths of darkness back into loving life once again. Make this “must-read” book the one you talk about for the rest of your life.